If your battery appears to be dead, try a few steps to start your car before determining if it needs to be replaced or towed. Discovering your vehicle won't start due to a dead battery is a sure way to dampen anyone's day. In many cases the cause of your battery's loss of charge will be apparent, such as leaving your headlights or radio on overnight, while other times the situation will not be as clear. In any case, your primary concern is getting your battery going again, so you can continue with your day. Your next concern is determining if this problem is going to happen again, so you may need to properly service your battery or have it replaced entirely. When you turn your ignition key and nothing happens, this is a sure sign that a dead battery is the culprit. If, however, your vehicle makes an attempt to start but can't quite get there, it could be an indicator of multiple issues, although a failing battery is often the cause. Until you find evidence to the contrary, however, treat this situation as you would the first because it has the simplest solution. 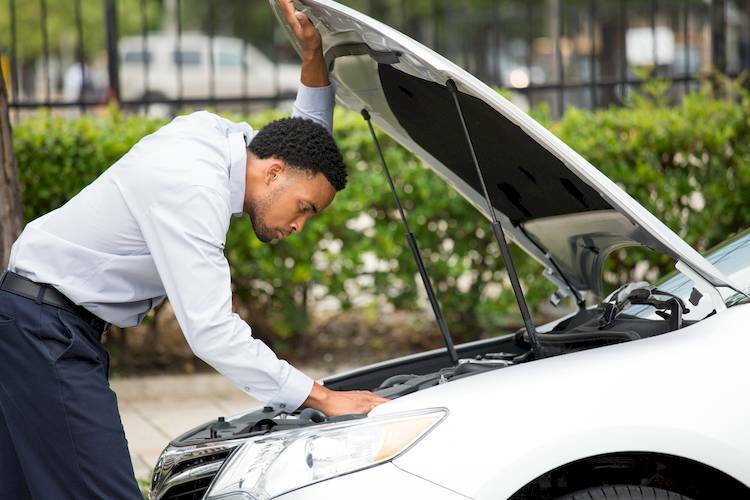 Oftentimes, even if something like a bad alternator is at the root of the problem, the following methods of dealing with a dead battery will get you back on the road to address the immediate issue. 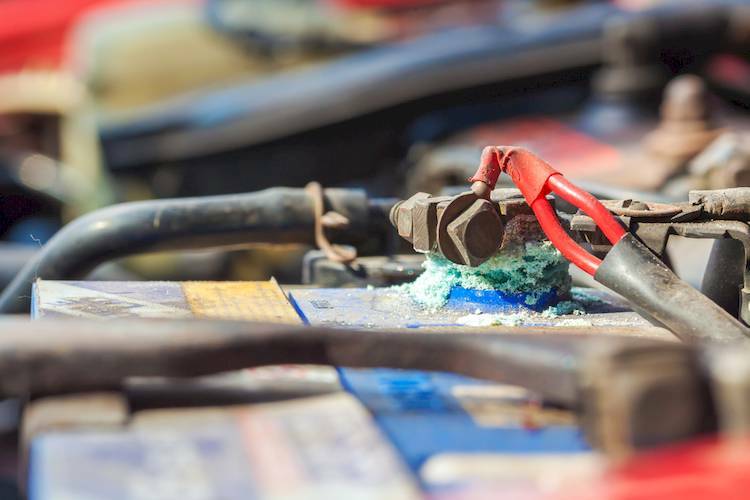 If there is white, blue, or green powdery buildup around your terminals, this can prevent a good connection between your battery and your battery cables. Cleaning them may restore this connection enough to get your vehicle started again, but – since the buildup is a product of acid – you should promptly have your battery tested to get to the root of the problem. Step 1: Remove the cables. Remove the negative cable from the battery terminal (indicated by a black color or minus sign) with a socket wrench and then the positive cable from its terminal (marked by a red color or plus sign), taking care that the two cables' ends do not make contact. Tip: It is advisable to wear plastic gloves whenever touching corrosion on an automotive battery because the acidic substance will irritate your skin. Step 2: Sprinkle baking soda. Liberally sprinkle baking soda over the terminals to neutralize the acid. Step 3: Wipe away the buildup. Wet a rag with water, and wipe the powdery buildup and excess baking soda from the terminals. If the buildup is too much for your rag to remove, try brushing it off first with an old toothbrush or other brush with plastic bristles. Warning: Do not use a metal brush or anything with metal bristles to try and remove buildup from battery terminals due to a risk of shock. Step 4: Replace the battery cables. Replace the battery cables to their respective terminals, beginning with the positive and ending with the negative. Try starting your vehicle again. If it does not work, proceed to a different method. If you have access to another running vehicle, jump-starting your dead battery is likely your best option to quickly get back on the road. Once this is done, you may not have any further issues, but – if you find yourself in need of a jump-start regularly – your battery may need replacement or service. Step 1: Have both cars near each other. Park the donor car close enough to your vehicle that the jumper cables will reach between the two batteries, then open the hoods of both vehicles. Step 2: Hook up the dead car. Connect one of the positive jumper cable ends (indicated by a red color and/or a plus sign) to the positive battery terminal of the dead battery, then connect the closest negative cable end (marked by a black color and/or a minus sign) to the dead battery's negative terminal. Step 3: Hook up the donor car. Connect the other positive jumper cable end to the donor car's battery and then connect the remaining negative cable end to the donor car's negative terminal. Step 4: Start the donor car. Start the donor vehicle's engine and allow it to run for a minute or more. Step 5: Start the dead car. Try to start your vehicle. If it does not start, you can double check the cable's connections to the terminals and try again. In the event that a second try does not work, test your battery and replace it if necessary. When you find yourself with a dead battery without access to another running vehicle and have a battery charger on hand, you can breathe new life into your battery with a charger. This takes a little longer than a jump-start but is effective if you have the time to wait. Step 1: Hook up the battery charger. Connect the positive end of the battery charger to the positive battery terminal on your battery and then the negative end to your negative terminal. Step 2: Plug in the charger. Plug the battery charger into a wall outlet or other power source, and turn it on. Step 3: Turn off the charger. When the charger indicates your battery has a full charge (often after a 24-hour wait), turn the battery charger off, remove the cables from your terminals in reverse order. Step 4: Try starting your car. If it does not start, your battery will need further testing or replacement. Warning: Although most modern battery chargers have an automatic shut-off that causes it to stop charging once your battery is full, older or cheaper charges may not have this feature. If it is not clearly indicated on the charger or in its instructions that it includes the shut-off feature, you will need to periodically check in on your charging progress and turn it off manually. Step 1: Test your battery with a multimeter. If you have a multimeter on hand, you can test your battery for leaks following your product's instructions. A reading of 50 mA or less is acceptable, but a higher reading indicates the need to replace your battery. This will not, however, solve your immediate problem of a dead battery and will require you to use one of the previous three methods to start your vehicle. Step 2: Test your battery with a voltmeter. A voltmeter is also capable of testing your battery's charging system, but it requires your car to already be running to use. These connect to your battery terminals in the same manner as a charger, and a reading of between 14.0 and 14.5 volts is normal with anything less indicating you need a new alternator. If you do not feel confident handling your dead battery problems on your own, feel free to contact our experienced technicians. After a recharge by jumping or a battery charger to get moving again, you should have a professional inspect your battery for more serious problems. 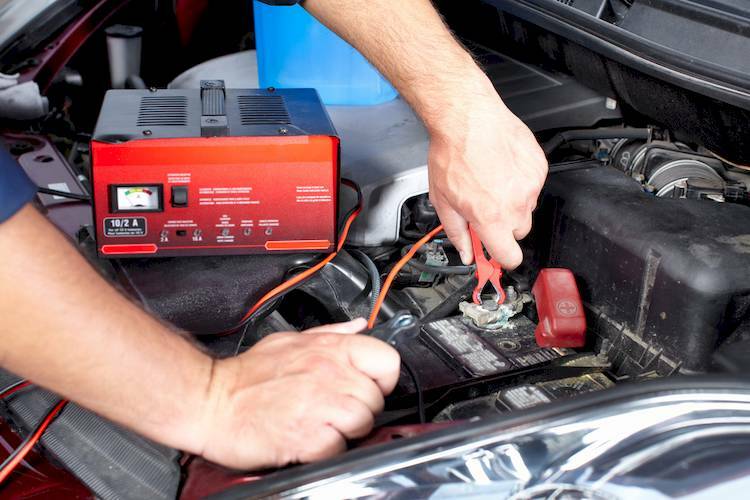 He or she will assess the condition of your battery and take the appropriate action, whether that be to service the battery you have or replace your battery with a new one.